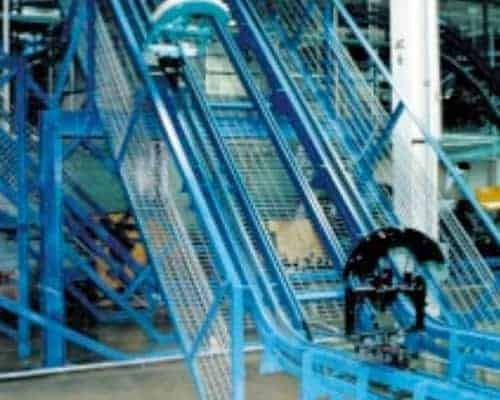 What are conveyor types and their uses? Industrial conveyors have many different designs and uses. Common conveyor types are belt conveyors, roller conveyors, motorized roller conveyors and overhead conveyors. 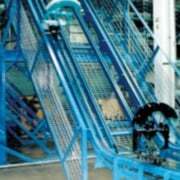 They can be categorized as floor conveyors (mounted on the floor) or overhead conveyors. They are used to move products, create buffers and deliver products in sequence in a production process. What are the different types of conveyors? So why do people use conveyors? 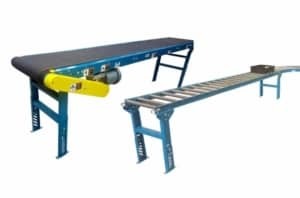 Conveyors are one of the most flexible types of industrial equipment, and when correctly specified and installed they can dramatically improve productivity, efficiency and safety. Ultimation has solutions as affordable as a $50 roller conveyor, or as sophisticated as a $5M or more fully automated conveyor system. Conveyors are used to transport bulk material too, like gravel or iron ore.
We typically begin with the basic product information. It’s helpful for us to understand the productive role that your conveyor performs. Is it moving parts, storing them, re-sequencing them or providing a working surface where they are worked on while they move? 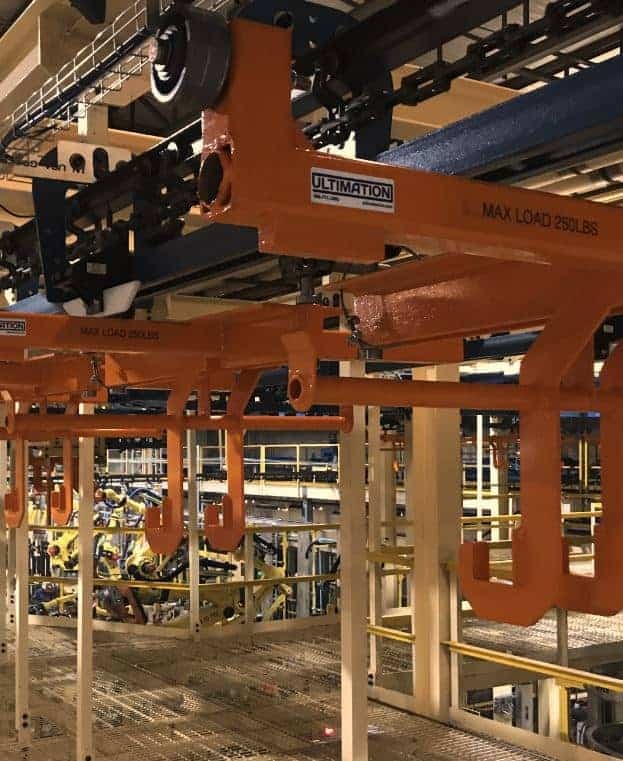 Depending on these factors we can then select from the various conveyor types available and see which ones can do the job and provide the best benefits. Conveyors are sometimes categorized as floor conveyors or overhead conveyors as this is often an important decision point. 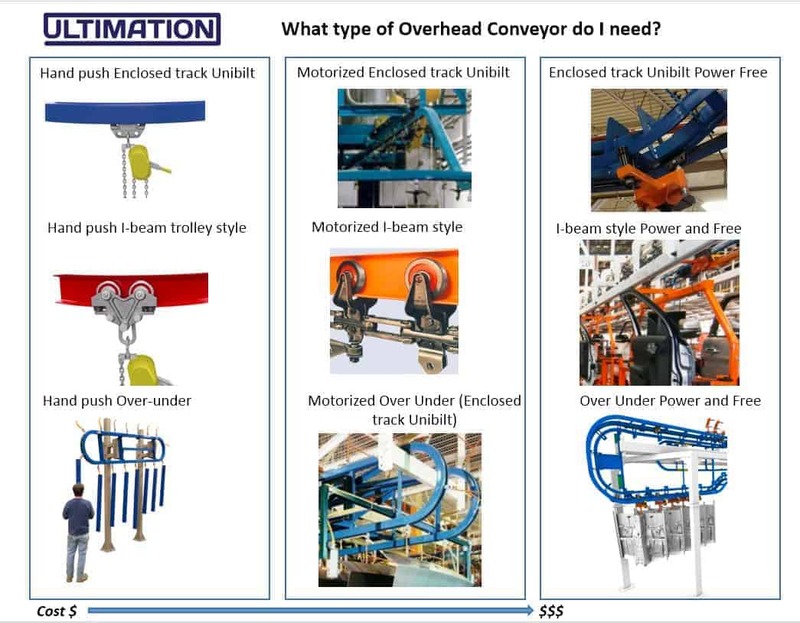 Overhead conveyors can take many different forms (see this graphic here on the different types) but they all share the benefit that the conveyor itself is mounted above the part it is moving and they therefore use production space that is not occupied with other equipment. This can enable the overhead plant space to become productive, like using it for a buffer or storage bank. 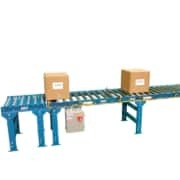 If more space is available, floor style conveyors may be more suitable. 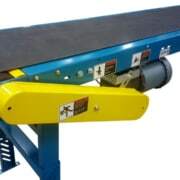 These include belt conveyors, gravity roller conveyors, skatewheel conveyors and slat conveyors. The material below has a short summary of each one of the more common conveyor types that are available. 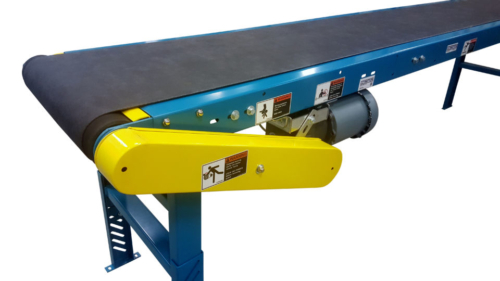 Sometimes called “Conveyor belt” by our customers (which is actually just the belting material), a belt conveyor is one of the simplest conveyor types. It moves parts from one end to the other. Speed can be variable with a variable speed drive. Belt conveyors can’t be used as a working surface, they can’t be used to present parts to a robot, and they can’t buffer or sequence parts. 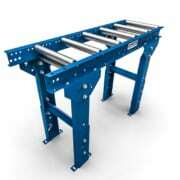 But their simplicity makes them one of the most common conveyor types available. They belong to the floor conveyor group. Learn more about them here. Ready to buy? Here’s the range available for online purchase. Also one of the simplest types, they are very affordable. A series of rollers mounted on a side frame provides the rolling surface. When mounted on a decline angle, parts move by themselves. However if using gravity conveyors for parts of different size and weight it can be difficult to control the speed and angle. Parts running into each other may cause damage. But compared with carrying parts from point A to point B, a gravity conveyor is often a great starting point for productivity improvement. Learn more about them here. Ready to buy? Here’s the range available for online purchase. 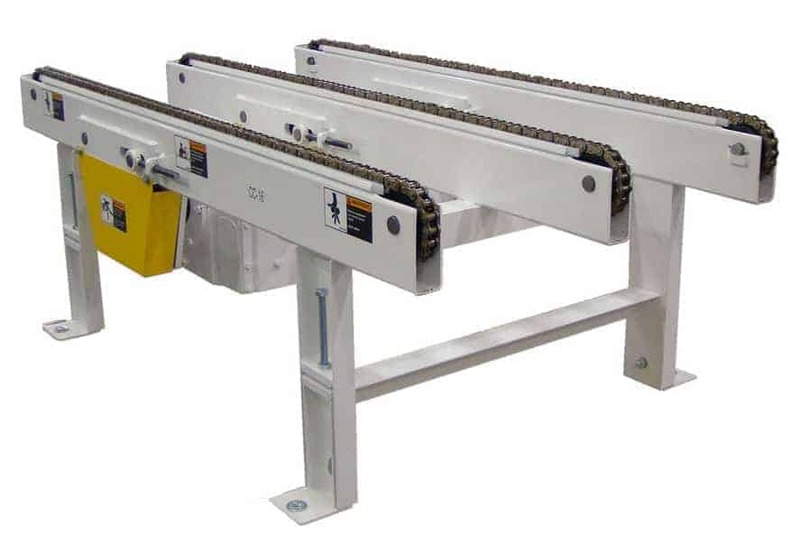 Floor mounted chain conveyors are great for heavy items and especially for items that have an uneven lower surface. The chains provide two or three contact points on the bottom of the load, and as the chain moves it carries the product forward. They’re used to carry pallets and large industrial containers. 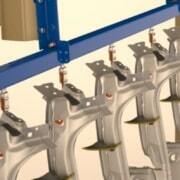 If necessary, products can be mounted on a fixture, or “skid” and the fixture can be carried along the chains. This is a common application in auto plants. They are heavy duty, and generally move at slow speeds. Learn more about them here. Ready to buy? Here’s the range available for online purchase. So if we combine the rollers from a gravity conveyor with the chains of a chain conveyor, we can link the rollers together, add a motor and gearbox and now we have a live roller conveyor or chain driven live roller conveyor. Sometimes people in the industry use the acronym CDLR. 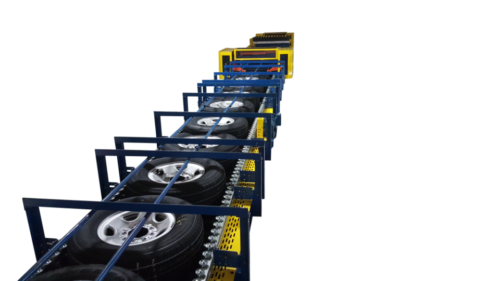 Members of the floor conveyor family, they are heavy duty conveyors that can transport pallets, seats (on skids or pallets), tires, containers and a multitude of products. If fitted with loose plastic sleeves over the rollers as shown in the photo below, they can accumulate or buffer product as the rollers can keep moving even though the product on top is not moving. Chains are linked together from one roller to the next on the side. Learn more about them here. What if we put the motor inside the conveyor roller? 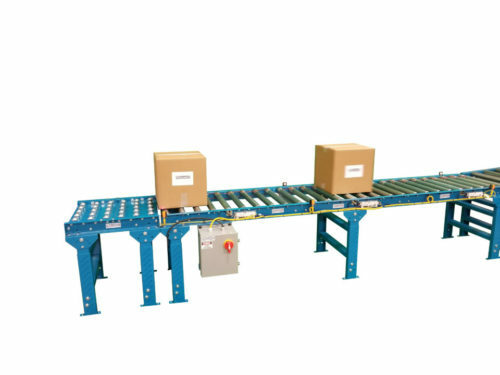 These modern conveyors are at the heart of today’s sophisticated distribution centers. With high speeds of up to 200 feet per minute or more, your Amazon packages, mail package or other item delivered to your home probably passed along miles of these type or conveyors. 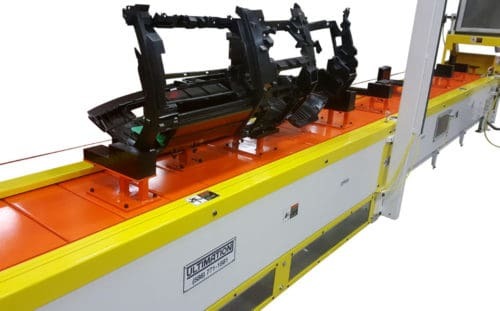 Using one or more motor driven roller per zone to create a series of zones along the conveyor, the motorized roller is connected to the other rollers in the same zone by plastic or reinforced belts. Photo eyes turn the motors on and off, and parts move to the next zone when space is available. This way the parts never touch, avoiding damage. This is caused “zero pressure accumulation” and it’s a very valuable benefit. An added bonus? 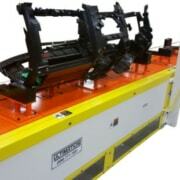 You can convert a gravity conveyor to a motorized roller conveyor. 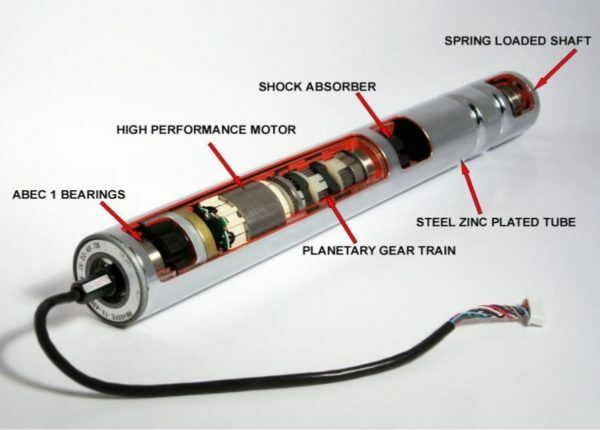 Learn more the motors and how MDR conveyors work here. Ready to buy? We have a range of MDR conveyors, motors and power supplies available for online purchase. 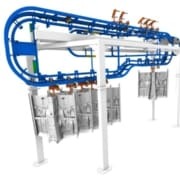 A slat conveyor is basically a two-strand chain conveyor with slats connected to the chain and a guiding system for the slats. This creates a smooth surface to which tooling details or fixtures can be mounted to hold parts in the desired position. Sometimes the fixtures can also allow the part to rotate 90 degrees or 180 degrees as required in several planes. Therefore you can use slat conveyors as a working surface for assembly operations. Positioning of the part is also quite precise, so it’s common for robots to perform the loading or unloading operation at one or more ends of a slat conveyor. Learn more about them here. 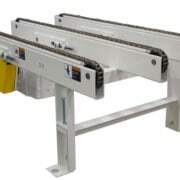 Moving on to the overhead family of conveyor types, the simplest systems are hand pushed beam trolley systems. 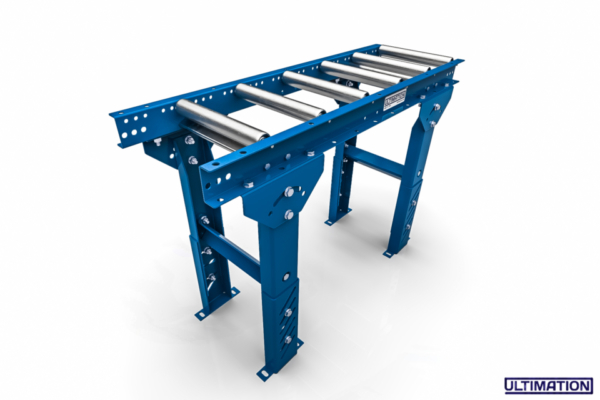 Using either an enclosed track or I-beam section as a track, these conveyor types are extremely versatile, easy to set up and affordable. They can be mounted above the workplace with roof-supported or floor supported steel structures. For more information on the nine different types of overhead conveyors, see this graphic. You can purchase trolleys for these systems for under $50 each and the tracks are also very affordable. Learn more about them here or buy them online here. 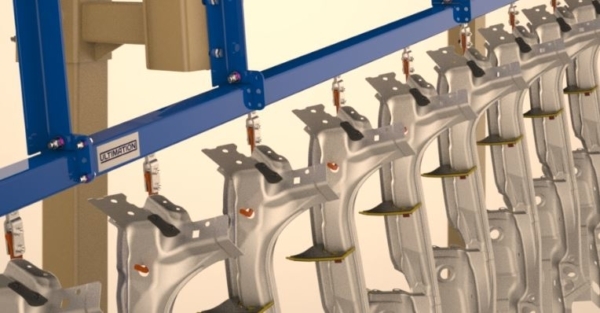 Beam trolley systems are especially popular for painting and finishing operations, as the mechanism remains above the part and is not covered. One of the most common conveyor types is an overhead conveyor with the trolleys connected together with a chain. 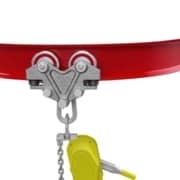 The chain can either be enclosed (“enclosed track”) or open below an I-beam. These style of conveyors are installed in nearly every high volume production facility. 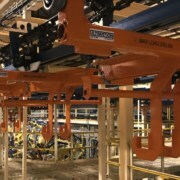 The chain is driven by a motor with a gearbox, and the parts to be moved are suspended from trolleys attached to the chain. Many different attachment types are used, and for complex parts a fixture or carrier is suspended from several trolleys to locate the part in position. 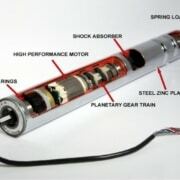 The chain can be constantly moving, or alternatively the system can index parts from one assembly station to the next at a predetermined interval. Learn more about them here. Also in the overhead conveyor family is the power and free conveyor. It’s like a regular motorized overhead conveyor, except it has two tracks. In one track, the chain is continuously running. In the other track, the trolleys are moved along by the chain with pusher mechanisms (known as “pusher dogs”) mounted at regular intervals. When two trolleys are pressing against each other, the dogs can slide over the top. Likewise, a stop blade can be used with a pneumatic cylinder to replicate this geometry. 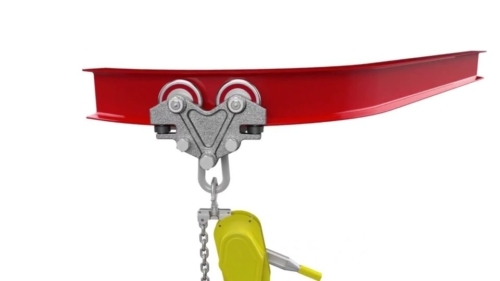 This allow trolleys to start or stop movement virtually anywhere in the system. This versatility makes power and free conveyors perhaps the most productive style of overhead conveyor. They can start, stop, buffer and re-sequence parts with switches. Learn more about them here. As the name implies, they go over, and they go under. Available in hand push, motorized and power and free versions. Just like their overhead configurations, except the track is on the ground and the load is above the track. Useful in paint finishing applications to avoid dust or oil dripping onto parts. Widely used in automotive final assembly operations. What happens when you call or email us for help in selecting the best conveyor system? Our engineering team has deep expertise in designing, building and installing conveyor equipment in plants across the world. 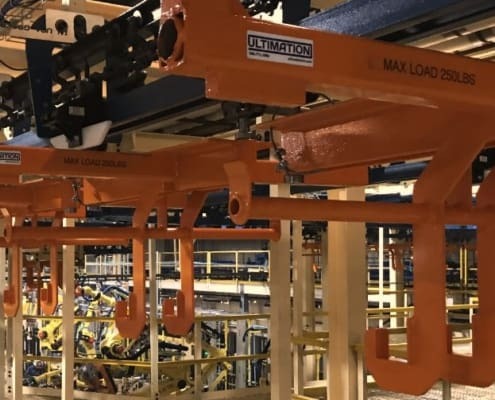 The process starts with ensuring the type of conveyor equipment is appropriate for the product, the operating conditions and the production volumes. 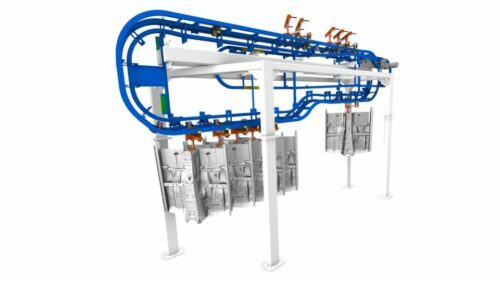 One of the things we are happy to do at the early stage of a project is to provide some free consulting advice to you on the different types of conveyors and automation equipment. At the early stages, we use phone calls and online Zoom meetings (video conferencing) to learn more about your products and your needs, and at the same time show you some different types of equipment and talk about the pros and cons of each type. Since many of our designs are already available in 3D CAD formats, we’re often also able to do a quick mock-up of what an assembly system would look like. Then we would probably do an on-site meeting and try to focus this down to the best one of two possible conveyor types that would give the most benefits for the lowest investment.